The European section of the 2018 FIFA World Cup qualification acted as qualifiers for the 2018 FIFA World Cup, which is being held in Russia, for national teams which are members of the Union of European Football Associations (UEFA). Apart from Russia, who qualified automatically as hosts, a total of 13 slots in the final tournament were available for UEFA teams. The qualifying format was confirmed by the UEFA Executive Committee meeting on 22–23 March 2015 in Vienna. The qualification process started on 4 September 2016, almost two months after UEFA Euro 2016, and ended on 14 November 2017. Belgium, England, France, Germany, Iceland (for the first time), Poland, Portugal, Serbia, and Spain qualified in the first round by winning their groups. Croatia, Denmark, Sweden and Switzerland qualified by winning their playoffs. Four-time champions Italy missed out on qualification for the first time since 1958 after losing in the playoffs to Sweden, while the Netherlands failed to qualify for the tournament for the first time since 2002 after finishing third in 2014, and second in 2010. Iceland, with 335,000 inhabitants, became the smallest country ever to qualify for the World Cup finals. Apart from Russia, which qualified automatically as hosts, all remaining 52 FIFA-affiliated national teams from UEFA at the registration deadline of January 2015 entered qualification. Gibraltar, despite being a UEFA member since 2013, was not a FIFA member at the time of the registration deadline, and thus was not eligible to enter qualification for the FIFA World Cup. They appealed to the Court of Arbitration for Sport to challenge FIFA's refusal to grant membership in order to enter World Cup qualifying. In May 2016, the CAS found in Gibraltar's favour and ordered that FIFA put Gibraltar forward for FIFA membership, which would permit Gibraltar to take part in the qualifiers if membership was granted. Kosovo became a UEFA member on 3 May 2016, and together with Gibraltar, applied for membership in the FIFA Congress in 12–13 May 2016. FIFA confirmed that in the case both associations succeeded in becoming a member, they would be entitled to participate in the 2018 FIFA World Cup qualifiers, with UEFA tasked to integrate them into the competition. On 13 May 2016, both Kosovo and Gibraltar were officially admitted as FIFA members, thus allowing them to compete. UEFA created a task force to discuss how to integrate the two teams into the competition, and on 9 June 2016 UEFA announced that Kosovo would be assigned to Group I, to avoid meeting Bosnia and Herzegovina for security reasons, and Gibraltar would play in Group H.
First round (group stage): The 54 teams were divided into nine groups of six teams each to play home-and-away round-robin matches. The winners of each group qualified for the 2018 FIFA World Cup, and the eight best runners-up advanced to the second round (play-offs). Second round (play-offs): The eight best runners-up from the first round played against one other team over two legs, home and away. The draw for these matches was held on 17 October 2017. The first legs were played on 9–11 November, and the second legs were played on 12–14 November 2017. The winners of each tie qualified for the 2018 FIFA World Cup. Qualifying matches started in September 2016, following UEFA Euro 2016, and finished in November 2017. Kick-off times are largely set at 18:00 and 20:45 CET/CEST on Saturdays and Sundays, and 20:45 CET/CEST on Thursdays, Fridays, Mondays and Tuesdays. The fixture list was confirmed by UEFA on 26 July 2015, the day following the draw. The draw for the first round (group stage) was held as part of the 2018 FIFA World Cup Preliminary Draw on 25 July 2015, starting 18:00 MSK (UTC+3), at the Konstantinovsky Palace in Strelna, Saint Petersburg, Russia. Pot 1 contains the teams ranked 1–9. Pot 2 contains the teams ranked 10–18. Pot 3 contains the teams ranked 19–27. Pot 4 contains the teams ranked 28–36. Pot 5 contains the teams ranked 37–45. Pot 6 contains the teams ranked 46–52. Each six-team group contained one team from each of the six pots, while each five-team group contained one team from each of the first five pots. Due to the centralisation of media rights for European qualifiers, England, France, Germany, Italy, Spain and the Netherlands were all drawn into six-team groups. Netherlands and France were drawn together in Group A, and Spain and Italy were drawn together in Group G.
In consideration of the delicate political situations of the relationships between Armenia and Azerbaijan, UEFA requested that FIFA maintain the current UEFA policy not to draw these teams into the same qualification groups (since the two teams were in the same seeding pot, this would not have happened regardless of the request). Teams were allocated to seeding pots as follows (July 2015 FIFA Rankings shown in second column; the national teams which eventually qualified for the final tournament are presented in bold; the national teams who took part in the play-offs are presented in italic). The football associations of Gibraltar and Kosovo became members of FIFA following the draw but before any games had been played. As both associations became eligible to compete in the 2018 FIFA World Cup qualifiers, on 9 June 2016 it was decided Gibraltar would join Group H and Kosovo would join Group I, the only groups with five teams. In addition, it was decided that Kosovo could not play against Bosnia and Herzegovina or Serbia for security reasons, due to the disputed political status of Kosovo. Gibraltar and Spain had previously been kept separate from each other in UEFA Euro 2016 qualifying as a result of the disputed status of Gibraltar. All nine groups then had six teams. The hosts Russia were to be partnered with five-team Group H for friendlies. However, with the admission of Kosovo and Gibraltar, all groups were filled to contain six teams and the Russia friendlies against Group H teams were cancelled. UEFA vice-president Hryhoriy Surkis said that the UEFA management would deal with the issue of finding opponents for Russia to play friendlies. When the draw was made groups H and I had one team fewer than the other groups so it was decided that matches against the last-placed team in each of the six-team groups would not be included in the ranking of the second-placed teams. Even after the admission of Kosovo and Gibraltar, and with all groups now containing six teams, this rule did not change and matches against the sixth-placed team in all groups were still discarded. As a result, only eight matches played by each team were counted in the second-placed table. Rules for classification: Counting only matches against teams ranked first to fifth in the group, 1) Points; 2) Goal difference; 3) Goals scored; 4) Fair play points; 5) Drawing of lots. The eight best group runners-up contested the second round, where they were paired into four two-legged (home-and-away) fixtures. The draw for the second round (play-offs) was held on 17 October 2017, 14:00 CEST (UTC+2), at the FIFA headquarters in Zürich, Switzerland. The eight teams were seeded by FIFA World Rankings published on 16 October 2017, rather than qualifying record, with the top four teams in Pot 1, and the remaining four teams in Pot 2. It so happened that the top four teams by qualifying record were the same as the top four by FIFA World Ranking. Teams from Pot 1 played teams from Pot 2 on a home and away basis, with the order of legs decided by draw. The first legs were played on 9–11 November, and the second legs were played on 12–14 November 2017. The winners of each tie qualified for the World Cup. The following 14 teams from UEFA qualified for the final tournament. 1 Bold indicates champions for that year. Italic indicates hosts for that year. 2 Competed as Soviet Union. 3 Competed as West Germany. A separate team for East Germany also participated in qualifications during this time, having only competed in 1974. 4 From 1930 to 2006, Serbia competed as Yugoslavia and Serbia and Montenegro. 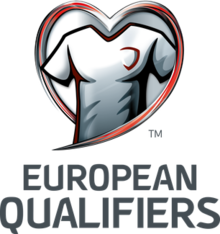 UEFA unveiled the branding for the qualifiers on 15 April 2013. It shows a national jersey inside a heart, and represents Europe, honour and ambition. The same branding was also used for the European qualifiers for the UEFA Euro 2016. ^ "Current allocation of FIFA World Cup™ confederation slots maintained". FIFA.com. 30 May 2015. ^ "Executive Committee date in Vienna". UEFA.org. 21 March 2015. ^ a b c "New distribution concept for club competitions approved". UEFA.org. 23 March 2015. ^ AFP. "Italy Miss Out on FIFA World Cup For the First Time Since 1958". News 18. Retrieved 14 November 2017. ^ "A win for the Netherlands, but not enough to secure World Cup qualification". Sydney Morning Herald. 11 October 2017. Archived from the original on 12 October 2017. ^ "Iceland become smallest nation ever to qualify for World Cup finals". The Guadian. 9 October 2017. Retrieved 20 November 2017. ^ "Road to Russia with new milestone". FIFA.com. 15 January 2015. ^ "Gibraltar appeal to court for Fifa recognition to enter World Cup qualifying". The Guardian. 12 February 2015. ^ "Ruling Moves Gibraltar Closer to FIFA Membership". New York Times. 2 May 2016. ^ "FIFA Council agrees on four-phase bidding process for 2026 FIFA World Cup". FIFA.com. 10 May 2016. ^ "Kosovo, Gibraltar join FIFA before 2018 World Cup qualifying". washingtonpost.com. Washington Post. 13 May 2016. ^ "Timeline for UEFA Presidential elections decided". UEFA. 18 May 2016. ^ a b c "Kosovo to play in Group I in European Qualifiers". uefa.org. Union of European Football Associations (UEFA). 9 June 2016. ^ a b c "Kosovo and Gibraltar assigned to 2018 FIFA World Cup qualifying groups". FIFA.com. Fédération Internationale de Football Association (FIFA). 9 June 2016. ^ "Draw Procedures – European Zone" (PDF). FIFA.com. ^ a b c d e f "FIFA World Cup qualifying draw format". UEFA.com. 16 June 2015. Archived from the original on 26 June 2016. ^ "World Cup European Qualifiers fixtures confirmed". UEFA.com. 26 July 2015. ^ "European teams learn World Cup qualifying fate". UEFA.com. 25 July 2015. ^ "FIFA/Coca-Cola World Ranking – July 2015 (UEFA)". FIFA.com. Fédération Internationale de Football Association. 9 July 2015. Retrieved 9 July 2015. ^ "Gibraltar komt in kwalificatiegroep van Rode Duivels voor WK" (in Dutch). 9 June 2016. Retrieved 9 June 2016. ^ "Gibraltar and Spain kept apart in Euro 2016 draw". Reuters via Yahoo Sports. 24 January 2014. ^ "Commercial regulations for the European qualifying matches for UEFA EURO 2016 and the 2018 FIFA World Cup" (PDF). UEFA.com. ^ "UEFA sets up commission on Kosovo, Gibraltar participation in 2018 World Cup qualifiers". tass.ru. Russian News Agency TASS. 18 May 2016. Retrieved 9 June 2016. ^ "Focus switches to World Cup qualifying". UEFA.com. 22 August 2016. ^ a b "As it stands: ranking of second-placed teams". UEFA.com. 3 October 2017. ^ "Competition format - FIFA World Cup - News - UEFA.com". uefa.com. UEFA. Retrieved 4 June 2016. ^ "FIFA World Cup European play-off draw to take place on 17 October". FIFA.com. 6 September 2017. This page was last edited on 20 March 2019, at 02:42 (UTC).